Can you take the heat? The Black Ninja Machete can! 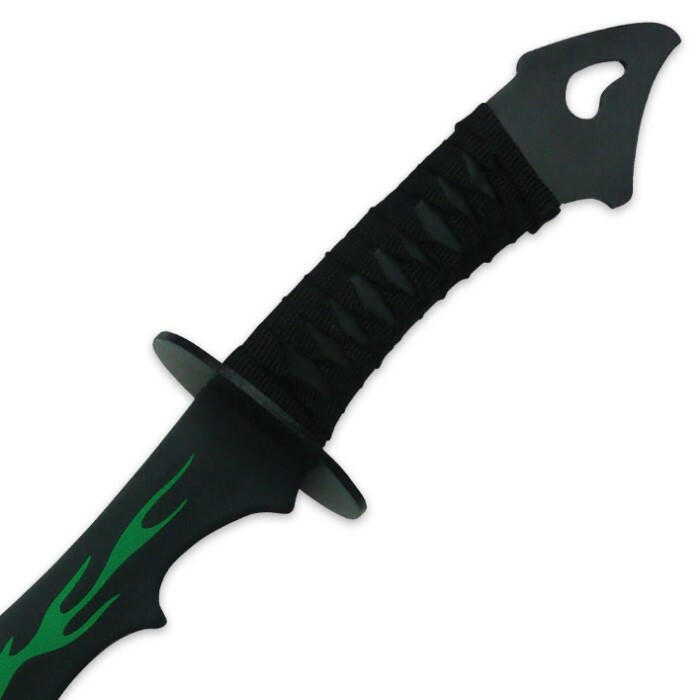 A solid stainless steel, full tang beast of blade, the Black Ninja features a sinister flame graphic that seems to lick at the guard and spine in an awesome display of fiery potency. 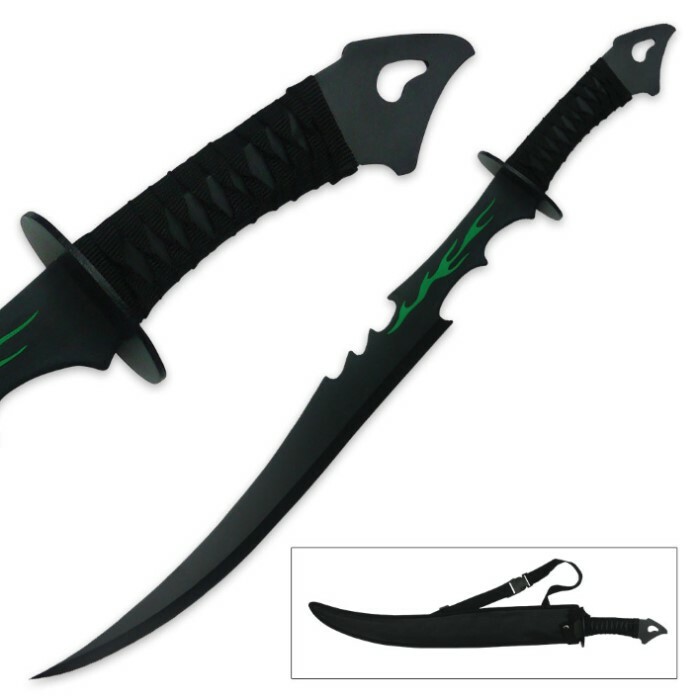 More than a mere "fantasy sword," this raging black menace boasts a razor sharp 21 1/4" stainless steel blade that's more than capable of "hacking it" in the real world. The robust blade is shrouded in a grim black finish well suited to the ominous modified trailing point blade shape - marked by jagged accents, a claw-like curve and a severe, stinging point. Like a tide of foreboding woe, the blackness continues onto the steel guard and black cord wrapped handle. This all consuming darkness provides the perfect backdrop for the brilliant green flames, which pop brilliantly against the monotone blade, guard and handle. Even the included heavy duty nylon sheath is black. Easy to transport, the sheath includes a handy adjustable shoulder strap and a lanyard hole at the tip for securing both ends to your person or gear. 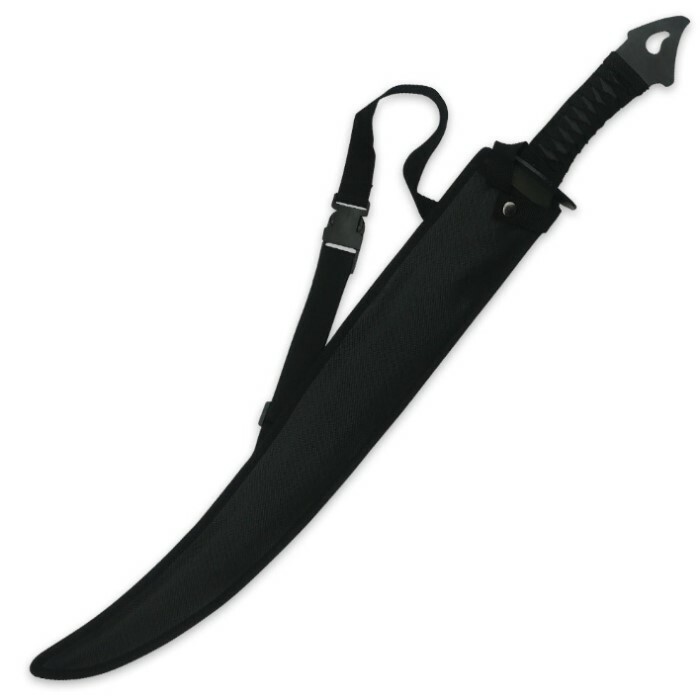 Stealthy, sinister and powerful, the Black Ninja Machete makes a great addition to any arsenal or weapon collection. Start fanning the flames today!